Though these lace Hey! Pinkgo Girl (alternative name: Hey! Apple Girl) sheet masks have been around for a couple of years, with some positive reviews from bloggers I like despite ho-hum ingredients lists, I didn’t pick any up until recently. I was excited to try one. I really wish I could say I liked it. 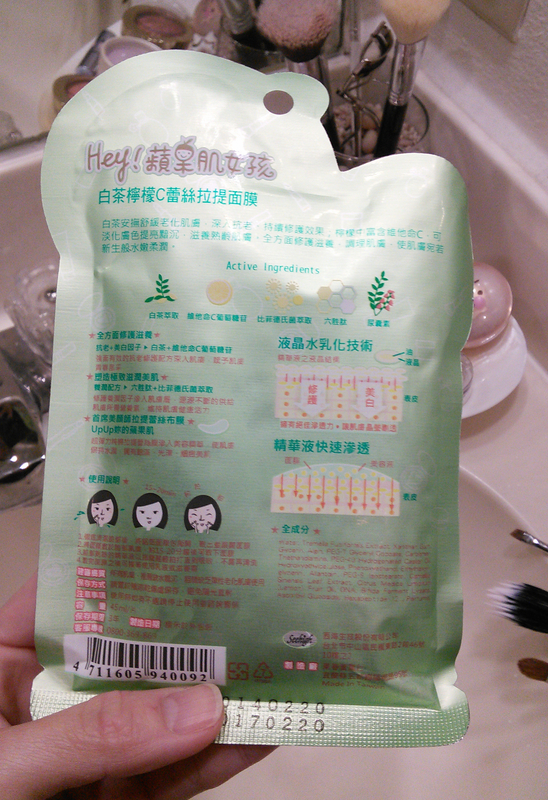 The mask packet is bulkier because the lace mask is thicker than regular sheet masks. Purpose: The Hey! Pinkgo Girl White Tea & Vitamin C lace sheet mask claims to brighten skin and diminish the signs of aging and fatigue. Do not use if: You are sensitive to fragrance, citrus oils, or anything else in the ingredients list. When and how to use: After cleansing and toning and either following or in place of your essence, serum, and ampoule steps, tear open packet, unfold mask, remove paper backing, and put on face. Loop the ear holes on either side of the mask over your ears, then pull the chin and neck section up under your jaw and fasten that section’s ear holes over your ears as well. Wear for 15-20 minutes as directed by mask instructions or longer if you like. 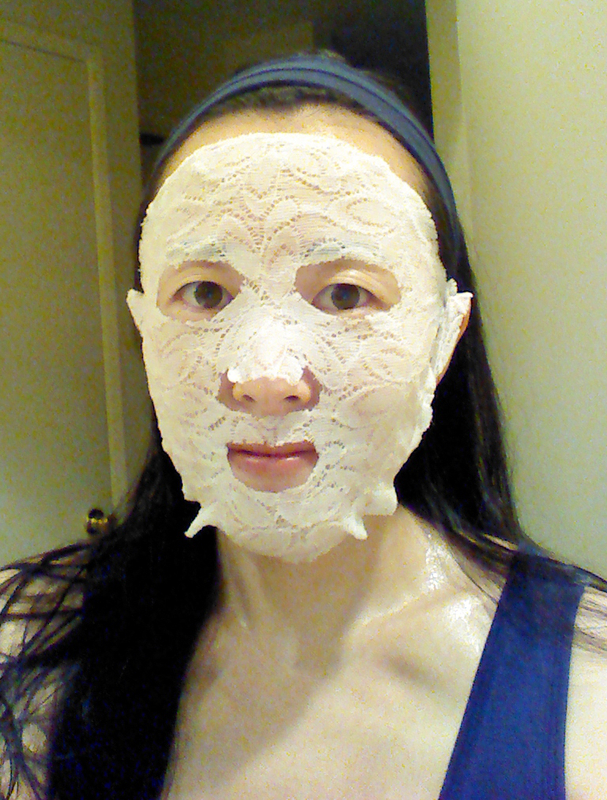 After removing mask, pat in remaining essence and finish with an occlusive moisturizing cream. The ingredients list says there’s DNA in this mask essence. DNA?! Whose DNA??? Notable ingredients: Despite the fact that this mask’s ingredients list is pretty mediocre overall as far as living up to its claims, I was very intrigued by the fact that the list doesn’t start with the standard “water, glycerin, butylene glycol” combo that heads up many a sheet mask essence formula. Instead, the second ingredient in the list (and therefore the second most abundant ingredient in the essence) is tremella fuciformis extract. This is the extract of the snow fungus mushroom, sometimes found in delicious Chinese cooking; as a topical skin care ingredient, it is claimed to have humectant properties comparable to hyaluronic acid, as well as antioxidant capabilities. I usually choose masks with antioxidant ingredients after I’ve spent a lot of time in the sun, as I did yesterday, since I think it best to mitigate any oxidative stress caused by UV exposure or chemical sunscreen use (a very small and, as far as I know, unproven risk, but something I do think about) as soon as possible. The algin, lemon fruit oil, and ascorbyl glucoside in the essence add some more free radical-scavenging antioxidant oomph. Unfortunately, the use of ascorbyl glucoside in the Hey! Pinkgo Girl White Tea & Vitamin C mask is a little disappointing. Ascorbyl glucoside is a relatively new compound formed by combining vitamin C with glucose. The ascorbyl glucoside breaks down into glucose and vitamin C in the skin. Ascorbyl glucoside is said to be more heat- and light-tolerant, slower to oxidize, and effective at higher pH values than L-ascorbic acid, and once broken down in the skin, the vitamin C should deliver the same antioxidant, skin brightening, and collagen synthesizing (over long term use) effects expected of LAA. But not much credible research has been done on ascorbyl glucoside yet, and it’s questionable how much vitamin C actually ends up delivered to the skin, with one side claiming a high concentration and the other side a low one. As we know from my skin care ingredients primer, concentration matters a great deal when it comes to vitamin C. The fact that ascorbyl glucoside is one of the last ingredients in the list is not promising. My CosDNA analysis turns up a couple of serious cautions. Algin, which is derived from brown algae, scores a 4 as a potential acne trigger and also a 4 as a potential irritant. The common pH adjuster triethanolamine gets a 2 in the acne column, and the common emulsifier carbomer gets a 1 as an potential irritant. Play it safe and patch test a bit of the essence from this mask (cut a small opening in the corner of the packet to squeeze out some essence, then close it with a binder clip) if you’ve never used products containing these ingredients before. 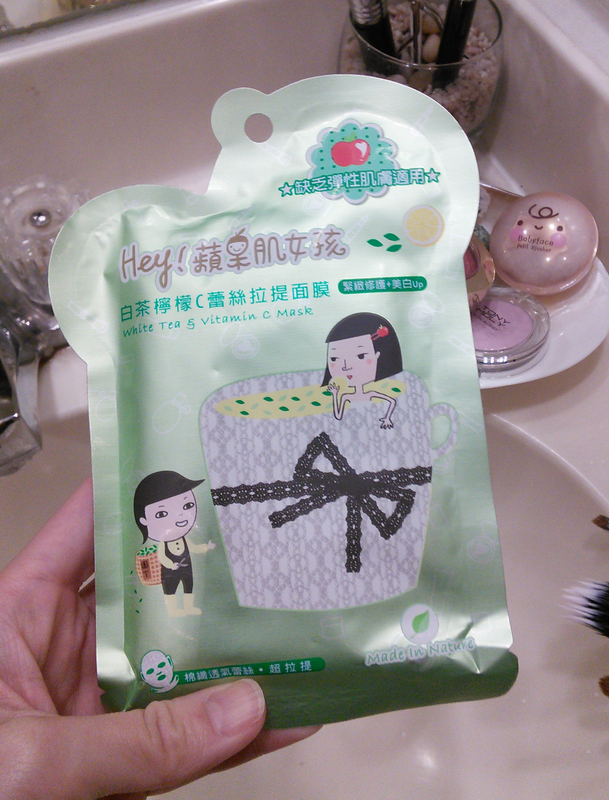 Much like My Beauty Diary masks, which also come from Taiwan, this mask is incredibly drippy. There’s a ton of extra essence in both the mask packet and soaked throughout the paper backing that makes it easier to unfold the lace. Lately I’ve taken to pre-treating my face with any extra mask essence, and I had plenty to work with here. I spread the drips from the mask packet over my skin, then gently swiped the backing over it as well before discarding it. The essence smells delicious, exactly like citrusy tea, and the fragrance isn’t strong, but it does linger. So. This sheet mask is interesting thanks to lace, the chin strap section, and the ear loops. I love how stretchy the material is, and how the ear loops hold it in place. The under-chin piece is a nice touch as well, delivering the full benefits of the mask to the often-neglected neck area. It is, however, really, really, REALLY freaky-looking. It’s basically a wet white lace gimp mask. Thing is, this mask reminded me of why I don’t like unlined lace garments ever. Lace makes my skin itch like crazy. The itching was almost unbearable throughout the 45 minutes I forced myself to keep this mask on, and while it was still wet enough to have worn for another 15 minutes or so, after 45, I just couldn’t take it anymore and had to get it off. Based on that discomfort alone, I won’t be repurchasing this mask for myself. For the purposes of this review, however, let’s take a look at the mask’s results. Upon taking off the mask, I was incredibly disappointed. All that itching for almost nothing. The brightening effect was minimal (vitamin C as a brightening agent needs more than a single 45-minute application at a presumably low concentration to show results): there was barely any contrast around my hairline and eyes, certainly less than I see with any other brightening mask in my collection. Plenty of leftover essence remained on my face but patted in surprisingly quickly given the lack of alcohol in this formulation, but despite all that essence, I felt barely more hydrated than I would have if I hadn’t used a mask at all. To be honest, if it hadn’t been so late at night, I would have #doublefisted and used a second sheet mask to compensate for this one’s lack of hydration. Instead, I applied heavier layers of my usual nighttime creams. In the morning, what little brightening effect there was had vanished. My skin did feel super, super silky, but in the first place, that could have been due to the extra Benton steam cream, Mizon starfish cream, and Mizon Good Night White sleeping mask, and in the second place, the Hey! Pinkgo Girl White Tea & Vitamin C sheet mask is marketed as a brightening mask, not a silky skin maker. Conclusion: I’m really pretty disappointed. I didn’t expect anything amazing out of this mask, but I did expect the standard results one gets from an inexpensive sheet mask: visible brightening and noticeable hydration. This mask delivered neither. Where can I buy Hey! Pinkgo Girl White Tea & Vitamin C sheet masks? The 8-piece variety set is the better value, in my opinion, and allows you to try out many different varieties to find the ones you like best. 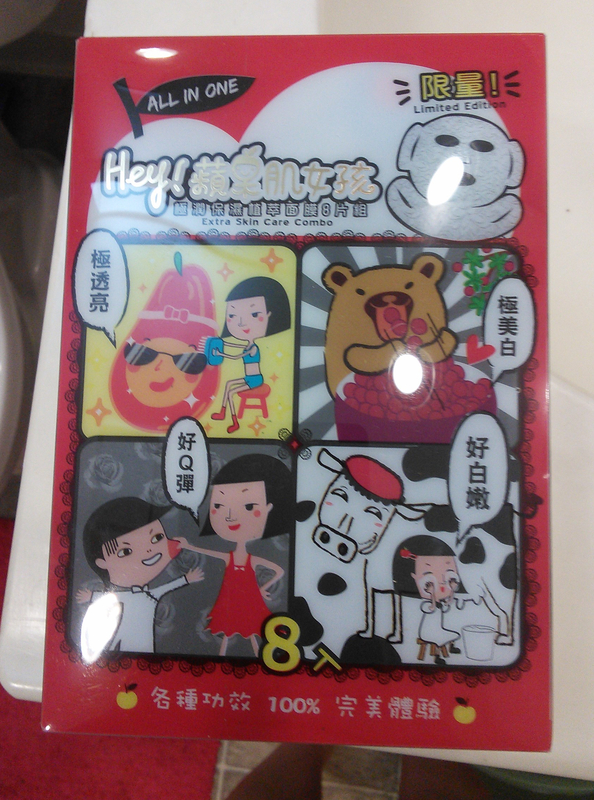 Have you tried any Hey! Pinkgo Girl masks yet? Do you want to? I’m still incredibly new to Asian beauty, but your review makes me want to steer clear of the lace masks. I was indeed disappointed with the whole experience. I still have 7 of the others to work through (I don’t think they’re all lace, thank God), so hopefully others will prove more effective for me. Oh man, 45 minutes of itchiness does not sound fun at all. I can’t remember what exactly comes in the combo pack, but hopefully you get a few of their non-lace masks… they don’t look as amusing, but they’re smooth-ish. I liked the Apple Girl masks fine (average hydration/brightening + above-average novelty factor), but no part of the experience made my face itch. Itchy face would = instant trashing.